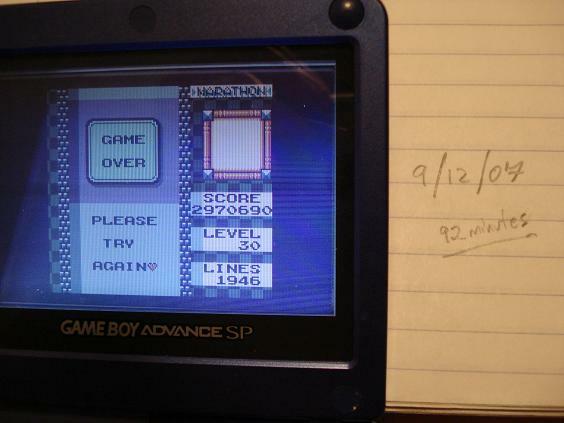 A few days ago I fired up my old Game Boy Advance and played a few games of Tetris just before bed. This was never a nightly tradition but for the past twelve years or so, it’s something I would do at least once a week. And for a few years during that span, it was something I tried to master with more persistence and focus than I’ve applied to almost any pursuit in my life. More about that later, I guess. Just wanted to set the scene. 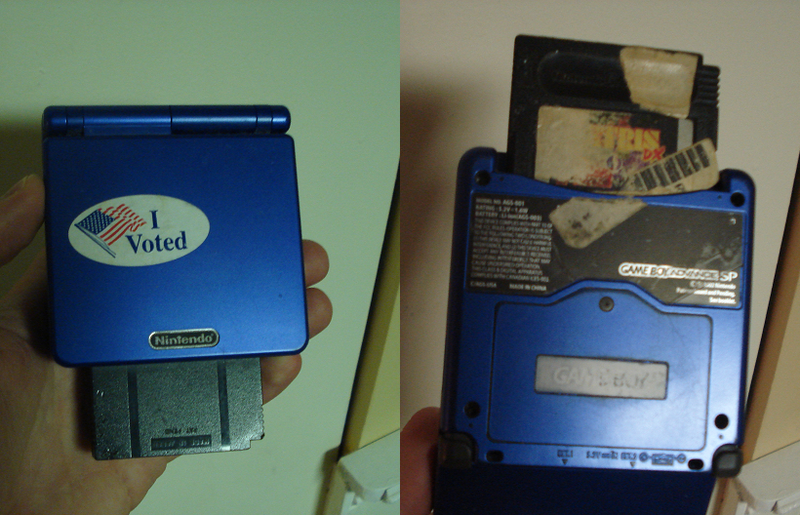 My GBA SP, decals worn off on bottom from years of sweaty palms. The next morning (this past Monday?) I woke up and decided to play a game or two while my coffee was brewing. I turned on the system, pressed start at the title screen, and… noticed that my name was somehow missing from the player profile selection screen. 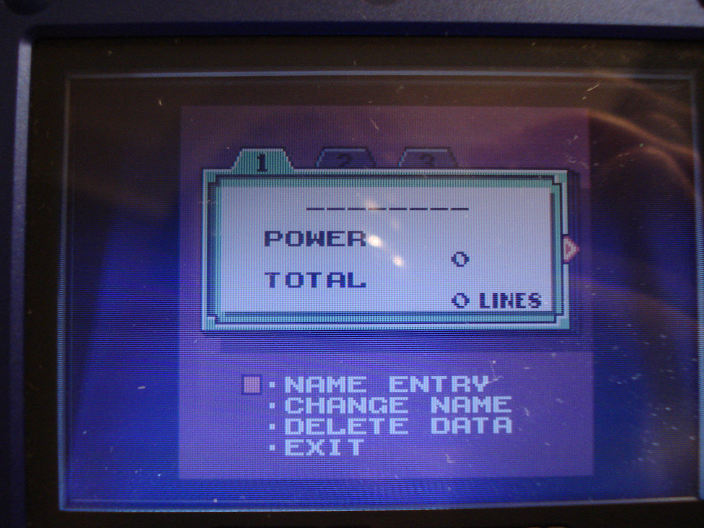 It would only take a few seconds for me to realize that all the data on my Tetris DX cartridge had somehow been erased, as the game would not allow me to select a “one player” game at all, but was forcing me into the name “entry” screen. I should have seen this coming. For the past two years, and especially the last few months, games would regularly freeze up or suddenly end and send me back to the title screen. Simply starting a game would often require two or three attempts as the system regularly restarted itself, and even in mid-game, the playing field would suddenly fill with random colors and shapes. I don’t know if it was a problem with the cartridge or with the system itself; I hadn’t actually removed the cartridge at all to play anything else in at least 5 or 6 years. When I first bought the Game Boy Advance back in 2001 (the terrible original version with its legendarily hard-to-see screen), I got a little mileage out of it with Advance Wars, Chu Chu Rocket and Sonic Advance. But by the time I traded in my original system for the vastly-improved Game Boy Advance SP (featuring the easy-to-view backlit screen), the system was quickly becoming nothing more than my portable Tetris player. This was a real waste of resources, to be sure, but I appreciated the design of the system in comparison to the brick that was the original Game Boy or Game Boy Color. Trust me, unless you’ve just bought a new cartridge, you never want to see this screen. Why was I so obsessed with Tetris? I doubt I could come up with a single answer that would please everyone. Some players appreciate its zen-like simplicity, while others regard it as a boring relic of the 8-bit age that’s not worth taking seriously in the 21st century. My first exposure to Tetris probably came from watching this. We never actually owned the original NES version of the game, although my neighbors, babysitters and friends all seemed to have it, so the cartridge itself was always around somewhere nearby whenever I needed it. I won’t be so bold as to call myself some kind of child prodigy or anything — I was just a kid who was hooked on videogames like millions of others — but I quickly found that while my Super Mario Brothers 3 or Contra skills were roughly on the same level as most of my friends, there was something about this game that was either unnecessarily frustrating them or particularly well-suited to myself, because I was always outplaying them to an embarrassing degree. I couldn’t understand why. The game wasn’t really that hard. Practically everyone is familiar with the basic strategy and the best way to score points. It’s right there in the title! But it seemed to be lost on everyone else but myself. “OhmygodwhatareyoudoingSTOPITyou’regoinnadie! !” — typical response of friends while watching me play. We did have a version of it on our “IBM-compatible” home PC that my mom got from someone at work. It was probably one of a thousand different bootlegged and re-translated versions of the game that floated out of the USSR before it was ever properly licensed over here. I’d sit and watch my mom play, get frustrated, curse and the screen and then at me because I was “distracting” her with advice. I wouldn’t make that mistake again. Those ancient experiences aside, Tetris was exclusively a console game for me until two years ago when I found tetrisfriends.com. Suddenly, I was playing against people from across the world at my desk at work. Nothing would ever be the same! Or so I thought. A few weeks later tech support took away our Internet privileges for reasons too boring and complicated to go into here. Suffice it to say that my foray into the world of competitive Tetris was over. That’s right, believe it or not I’ve actually got better things to do while at home and know better than to let it eat up my few free hours here away from school and work. I was better than any kid at school at this, too bad no one would let me play their copy during indoor recess (except for once, though the batteries went out a few minutes later). Over the years I played a few different console versions of the game. The original Game Boy version is a beast of a game that demands nothing less than absolute perfection. One small mistake at level 9 and you might as well turn the system off. It’s simply impossible to move the pieces fast enough horizontally across the field to fill in anything on the far sides unless you’re consistently playing with a very, very low stack of blocks. It’s a wonder how this infuriating, unforgiving, pea soup-toned version somehow got millions hooked on the game in the first place. 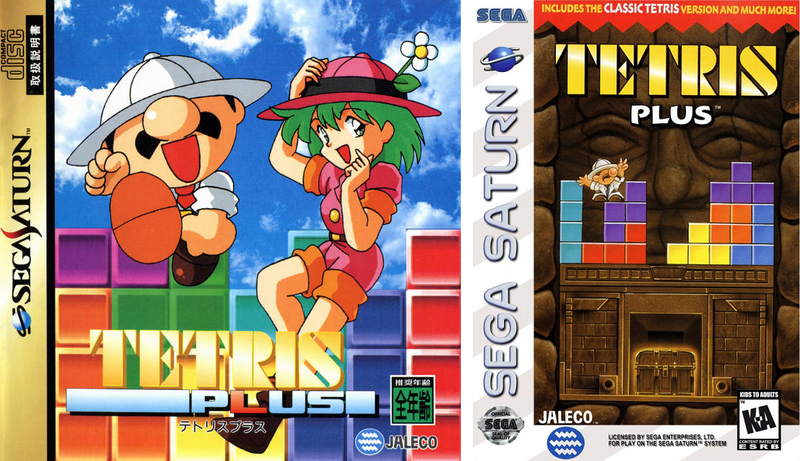 Tetris Plus, for the Sega Saturn, played as elegantly as any modern version of the game should, but its method of pushing the player into higher levels based partly on time passed (and not simply by lines scored) was an unnecessary change that partially broke the basic mode of the game. What I was left wanting after playing both of these versions was a Tetris game that stuck to the basics but also allowed players to save high scores. The original Game Boy Version (and if I’m not mistaken, the original NES version too) did not allow players to save high scores. And what game would benefit from such a basic feature more than Tetris? As Americans it was bad enough that we were stuck with the heavy, VHS-sized jewel case packaging that every Saturn game came in, but then they went the extra mile to erase the girl from the game, too. 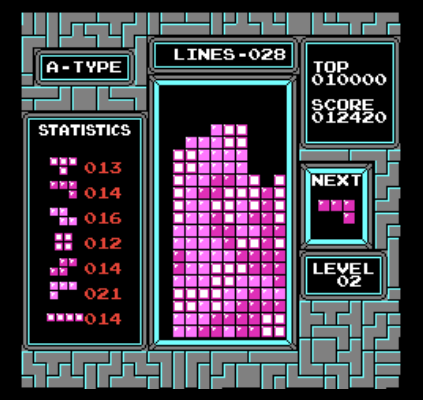 I finally found what I was looking for in Tetris DX, originally released for the Game Boy Color. 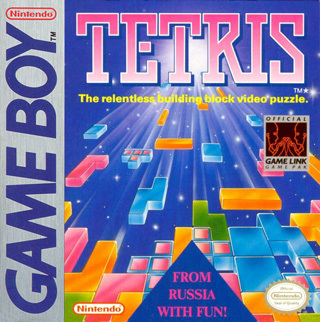 Not only did it feature color graphics and the much-desired score-saving feature, but it was a marked improvement over the slowly, clunky play of the original Tetris. Smoother graphics and a higher refresh rate (?) made for quicker block movement that was also easier to see. Not only could you now manipulate blocks in tight spaces and make the split second decisions that you could only dream about in the past, but you could also move horizontally at a speed that made once-impossible traps now escapable. I still believe this is the best version of the game that exists, and I played in nonstop for years. My high score on ultra mode (games timed at 3 minutes) was over 221,000. For ultra mode, the world record high score is 243,125. This means that someone (er, this guy) somehow found a way to score not just one extra tetris than myself in the three minutes of play, but two! This means that Bertrand is somehow dropping at least 6.67 pieces more than I am for every minute of gameplay and keeping it up during the entire three-minute duration. And I’m dropping every piece as fast as I possibly can, holding on the down arrow nearly continuously during the entire game. I don’t want to say this is impossible. But I do want to see it with my own eyes. Despite the fact that video evidence is (or at least was) required for score verification, Twin Galaxies does not make such material public. Even in the age of Youtube, we’re lucky when we can see first-hand footage of masters of this game at work at all (and I’m not talking about this, no one knows who or what this is or if it’s even real). I would absolutely throw down $10 (or more!) to be part of something like this (DX marathon champion Harry Hong on left). The world record for marathon mode (2,426,967) was much more within my reach, so back in 2007 I set up my video camera and recorded myself playing for a good two hours. It’s really hard to hold still and concentrate when there’s a camera aimed over your shoulder, but somehow I managed to beat the record by a good half-million points or so. I was pretty pleased with myself and thought about how and when I was going to submit the tape as I got ready for work that day. At work I visited Twin Galaxies’ website for more information… only to find that in the span of the few weeks since I’d last checked the scoreboard, someone else had not only beaten the record before me, but absolutely smashed the previous record and maxed out the score. I felt more than a little devastated by this development and my competitive fire would never burn quite as hot again. I’m not sure there’s any kind of reward or punishment that could possibly push me to reach such a score. I mean, it’s hard to explain how difficult it is to keep one’s mind focused on the game at hand as the hours slowly pass and the blocks begin to fall at speeds that would give most players nothing short of minor panic attacks. To stay mentally calm and collected, not to mention physically comfortable — eye strain, hand cramps, back pains, these become real factors when rules don’t allow players to pause or take any breaks — is a real challenge that requires both physical discipline and real strategies to deal with. Laying down or changing chairs would be a simple solution, but how to move the camera at the same time if you’re playing and recording by yourself? I didn’t really want to deal with these problems anymore so I stopped trying to a few years ago, and today it seems that the game itself has gone ahead and taken care of any future possibilities that I’d ever change my mind about it. For about 2 hours after this I was on top of the world. My final line total after a decade of play was over 315,000 lines. This may or may not be especially notable, I don’t know. Anyone playing that long would probably end up somewhere in the same neighborhood. Now that’s gone and I have no proof that I’d ever played the game at all. This has been a really weird. All things must pass, I guess. Am I going to try to go back to it? I do have a backup GBA SP that I could try the cartridge in. Maybe the game itself is just fried and there’s no hope. 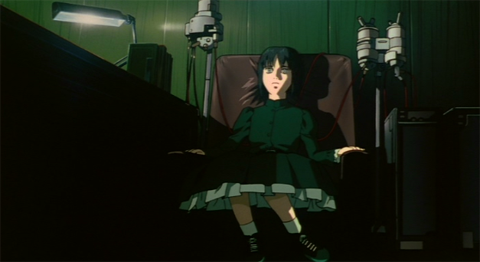 And maybe, in the end, this is actually a fortunate event, one less time-consuming distraction for me to deal with (albeit a tiny one in comparison to my Internet and anime habits) as I stand on the verge of a new period of my life in which I’ll need to muster every ounce of focus and dedication that I can on my studies. This has never been my strong suit so any Acts Of God that’ll tip the scales in my favor can and should be appreciated. I’m reading a Tetris thread on the Twin Galaxies message board (one of many there following the continued efforts of several players to perfect their play on various versions of the game). It’s encouraging to see that after so many years, players are still pushing themselves to reach higher and higher scores. It’s a testament to the timelessness of the game, which will hopefully be around in one form or another until I finally bite the dust. I wonder if I’m really out of the game for good. Will I ever find the spark to chase the dream again? Maybe this is just a hiatus. After a good two decades of hacking away at this game in one form or another, it’s probably high time I took a much-deserved break. This is probably going to totally alienate whatever few followers I have, but I’m changing my name here to better consolidate and control my online personas. All posts here (and on Twitter) will be signed by Seasons from now on. 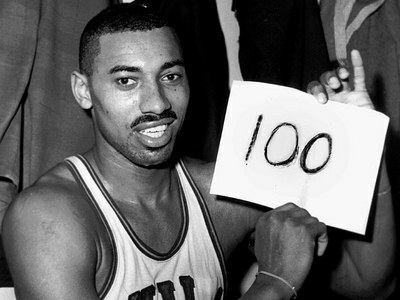 Also, I guess this is my 100th post. Took a lot longer than I was hoping but there’s a little sense of accomplishment in finally having made it after all this time.